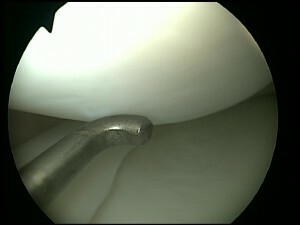 Knee arthroscopy is one of the most commonly performed knee operations. It is a key-hole procedure performed through two tiny (5mm) surgical cuts (incisions) either side of the lower end of the kneecap. Through these incisions a special fibre optic camera allows the inside of the knee joint to be viewed and special small instruments can be used to perform surgery inside the knee. Nearly all patients are treated as day cases and therefore are allowed home the same day. What procedures can be performed? A number of procedures can be performed at the time of arthroscopy, such as trimming or repair of meniscal tears, chondroplasty (smoothing of flaps and areas of irregular articular cartilage), removal of loose bodies and debris, plica resection, fat pad trimming, cartilage repair techniques such as microfracture, chondral grafting, mosaicplasty (in some cases), cartilage transplantation (in some cases) and anterior cruciate ligament (ACL) reconstruction.